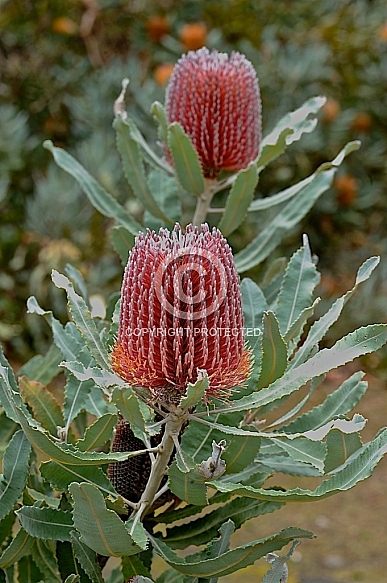 Description: Large, acorn-shaped, multi-coloured flower spikes are usually silver, red and yellow and are borne during autumn and winter on this gorgeous West Australian species. Other colour forms also exist, including bronze and soft yellow. An excellent cut flower. Bird attractive. Generally a bushy shrub of 2m under cultivation but can be a gnarled tree of up to 12m or more in nature. Very well-drained, lighter soils and sunny positions necessary for successful cultivation. Copyright © 2019 Matthews Botanical Images, All Rights Reserved.